Welcome to The Tech Challenge, presented by Dell! You and your teammates are joining a rich legacy of young innovators who step up to tackle a real-world challenge in true Silicon Valley style — with hard work, ingenuity and a lot of fun. Please read this entire guide carefully. The guidelines, resources and ideas will help you get the most out of your Tech Challenge experience. A team commitment to safety. Examples of teamwork, and how each person on the team contributed to the project. Multiple designs were considered, and an explanation of how the team decided which one to build. That the team tested the device during every stage of development. How the team overcame failure. This is our first time doing The Tech Challenge. How do we get started? Form a team. Find two to six people (including you) in Grades 4-12. You can have students from different grades on your team, but you’ll participate in the division of the member in the highest grade. Example: If the oldest student is in 9th grade and the rest of your team is in 7th grade, you’ll participate in the high school division. Find an adviser. Advisers must be at least 18 years old. Their job is to monitor safety rules and help your team stay on track. An adviser doesn’t have to be an engineer. They can be teachers, parents, scout leaders or any other responsible adult. Make sure your adviser reads the Adviser Guide. Register. Your adviser should register your team for The Tech Challenge. Make a calendar. Mark down important dates, including the showcase in March, as well as supporting events such as info clinics, team workshops and test trials. We have a team and an adviser, and we’ve registered. What now? Read the rules. This will help you understand the challenge. Updates will be emailed to your adviser. What exactly does an adviser do? Your adviser should guide your team but should not do the project for you. Ask for help finding answers, getting supplies and using tools. When they have nothing else to do, send them out for pizza! It’s OK to respectfully ask your adviser to step aside, but always make sure he or she is present when you use tools or test your device. How many times do we need to meet? This is up to your team. Make a list of things you want to get done at each meeting. This will help you decide how often you need to meet. A key to success: make a calendar and meet regularly. How many times do we have to come to The Tech? Really, once for the showcase. Also plan to come to one info clinic and team workshop, and at least one test trial. Read the rules and make a list of questions to ask. There will be people at these events to answer your questions. It’s a chance for you, your team, adviser and parents to learn about the challenge. You’ll do an activity that will help your team learn to work together. You’ll learn how to keep an engineering journal. Advisers and parents do not participate and will stay outside of the classroom. This is a chance for your team to test its device on official test rigs and get feedback from judges. You can also see what other teams have come up with, which might help you improve your design. Do you have any advice about working as part of a team? Work together. Listen to each other. Team members may have different skills and strengths. Use this to your advantage. Learn from your mistakes. The first device you build may not work. Innovators create, test and improve, over and over and over. They learn from failure and persevere to find the best solution. Start your engineering journal early. Take notes at the info clinic and every meeting. Keep them in your journal, then figure out what works well and what needs improvement. Be patient. The engineering design process doesn’t always go in order. Sometimes you move back to a step you’ve done before, like brainstorming, to help improve your design. Persevere. You’ll run into roadblocks. Don’t give up! OK, that’s all great, but really: how do we get started? Start your engineering journal. This can be as simple as keeping notes in a binder. More about this later. Define the problem. Talk about the challenge and break it down into parts. For example, the 2018 challenge, Drop & Dash, had at least two parts: survive a 10-foot drop and move the payload to the target. Some teams broke the problem down into even smaller parts. Talk about how your device would work in the real world. How would your solution affect the people you’re trying to help and their environment? This is part of what we call the Spirit of the Challenge, which we talk about at the end of this guide. Discuss criteria and constraints. These are goals and limits of your device. For example, what does it need to do? How big can it be? How much can it weigh? Make a budget. We’re not just talking about money here. We’re also talking about budgeting time. How much time do you have to brainstorm? How much work do you need to do to be ready for test trials or the showcase? Don’t judge. There are no bad or stupid ideas. Build on the ideas of your teammates. One person says, “we could do this” and another says, “yes, and we could do this too” and BAM! You have a great idea. Stay focused. Hold off on discussing things not related to the challenge until after you finish talking about your project. Go for quantity. Come up with as many ideas as you can in a short period of time. Encourage crazy ideas. You never know what might work! Draw quick sketches. A picture is worth a thousand words. Lots of paper, Post-its, pens, markers and crayons in many colors. The rules, pictures of the test rig and your engineering journal. 2. Pick a team member to write down ideas and keep them in your journal. 3. Talk about the challenge. How have similar problems been solved in the past? What do you know about the science and engineering behind the challenge? Try not to brainstorm for more than an hour. List ideas and draw quick sketches. Be sure to list everybody’s ideas. Review the ideas at the end of your brainstorming sessions, before you forget any details. Organize your ideas into categories. As a team, pick which ideas you want to work on first. Don’t throw any ideas away. Who knows? They may be useful to you later. Popcorn: Shout out ideas quickly, like popping popcorn. You’ll need a few people to write down ideas since this can move quickly. Other People’s Shoes: Think of ways different people, like Harry Potter, Santa Claus, your science teacher, etc. would solve your problem. Post-it: Everyone gets a stack of Post-its. Each person writes ideas on the notes that all get put on a wall for evaluation. You might brainstorm not just at the beginning of the engineering design process, but also at other times. Run into problems mid-way through your project? Can’t find a quick fix? Use your new brainstorming skills to figure out a solution! You guys talk a lot about the engineering design process. What is that? Retest (multiple times) until solution is as successful as possible. Engineers don’t always follow these steps in order. You might design something, test it, find a problem and go back to an earlier step to modify your design. This is called iteration, and it’s likely that in your process you will do the same. How does The Tech Challenge teach engineering? 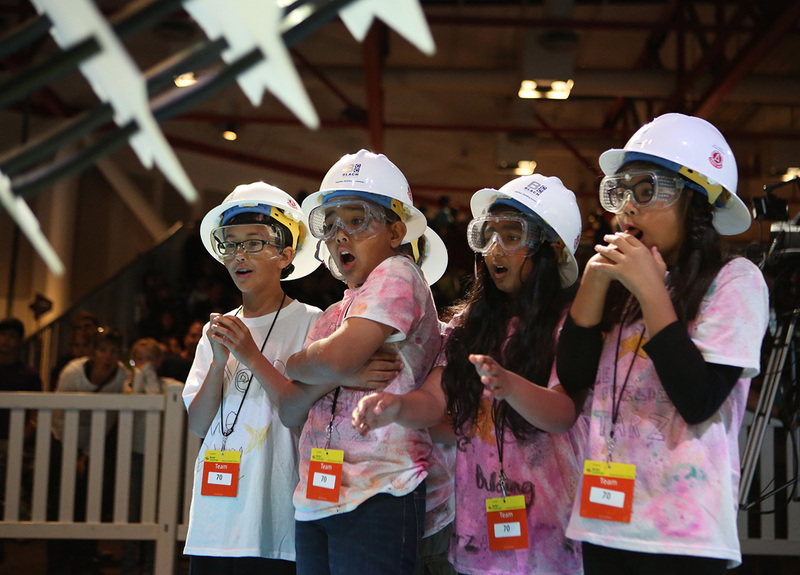 The Tech Challenge includes fun, the chance to build stuff, teamwork and sportsmanship, but there are official guidelines called NGSS Engineering Standards that are also incorporated into The Tech Challenge philosophy and rules. The guidelines make for heavy reading, but if you want to give it a try, click here and check them out! As always, if you have questions email challenge@thetech.org and we’ll get right back to you. Meanwhile, here’s shortened versions of a few concepts from these standards we use in The Tech Challenge. Define the criteria and constraints of the challenge, taking into account scientific principles, how your solution may affect people and the environment and how those may affect your solution. Use an organized process to find which of your brainstormed solutions best meets the criteria and constraints of the challenge. Test early and often. Collect and analyze data to see the similarities and differences between your brainstormed solutions and support your argument that you’ve found the best one. Be able to show how your device evolved from brainstorming to final design. At every stage of development. For example, build a rapid prototype. Test it. Did your prototype do what you expected it to do? Refine your prototype. Test it again. Did it work better or worse than it did the first time? Make more changes. Test early and often. Remember to write the results of all your testing in your journal, and describe how each of your tests helped you make your device better. You guys also talk a lot about failure. Isn’t failure a bad thing? Every engineering project comes with plenty of failure ... or rather, plenty of opportunities to improve your design. How else will you know what doesn’t work? Use that information to make your solution better. Would it work in real life? Here’s a simple decision matrix you can use to identify your ideas’ pros and cons. This is just an example. Change the information you collect to suit your project. Use the data you collect to determine which is the best solution for your team to build. Don’t forget to record your argument and decision in your engineering journal. Why do we need to keep an engineering journal? Documentation is a very important part of the engineering design process, and keeping a journal is an key part of The Tech Challenge. How your team develops its solution is as important as the solution itself. Team members will be asked about the steps they followed in building the device, and the engineering journal is a record of this process. How do we start our engineering journal? It’s easy: write down what you talk about at your meetings. Start writing at your first meeting. Label these notes “Minutes” and put the date at the top of the page. List the names of the people who came to each meeting. One of the first things you should write down is what problem you’re trying to solve. It’s helpful to break the problem down into parts. Discuss what the rules say about what you can and can’t do — these are your criteria and constraints. For example, how big can your device be? How heavy? Do you understand the science behind the challenge? How long does your device have to complete the challenge?? Last, talk about (and write down!) the effects your device would have on the real world and the people you’re trying to help. What are we going to do today? What are our goals? What do we need to do at the next meeting? Use words, photographs or sketches to record your answers in your journal. This is the beginning of a great engineering journal! Your answers to many questions may change as you research, prototype, build and test. Work on your journal as you go. Your journal is a living document, which means the team will add to it throughout The Tech Challenge. Some teams have one person document the team’s work along the way; others have multiple people make entries. Either works, but your team will turn in only one journal for judging. If several team members take notes, choose the best entries and organize them into one journal. What should we include in our journal? Be organized: Date all entries, number the pages, and put tabs on some pages to mark different sections or topics. Title page: The first page should contain your team name and number, names of all team members and their school(s) or group. A short description of the challenge is a good reminder of the team’s goal. Table of contents: Make it easy to find things in your journal. Research: Tell us about your research. Did you find ideas for solutions in books, videos or on the Internet? Did you see how other people solved similar problems? TIP: check out our resources page for places to start. Minutes from meetings: These can be short lists of what the team talked about or paragraphs recording everything you said, heard and did. The best journals include the meeting date, who was there, location, purpose of meeting, what you talked about, decisions made, future actions and more. Brainstorming notes: The best journals include all brainstormed ideas, even the craziest ones, with rough sketches and reasons why the team did (or didn’t) do something. Explain why the team settled on its final design. Design sheets: Create one for each idea and add them to your journal. See an example at the end of this guide, or make your own. Pictures: A sketch is a quick picture of an idea. A drawing is more detailed and includes measurements. The best journals contain sketches, drawings and photos of the design (or parts of it) as well as ideas that were rejected. Description of final device: After your final design is tested and ready to go, put a description of it in your journal. Many journals don’t describe the final design or leave it buried in brainstorming notes. The best journals have a clear explanation of how the device works and enough pictures so that someone else can easily understand it. Measurements: Include measurements that help a reader understand the size of the device. Materials list: Use detail when describing what you used to build your device, especially what you used for the final version. Instead of “an arm with a claw” or “a piece of pipe,” the best journals would say “a four-foot length of schedule 40 PVC plastic pipe.” Someone should be able to build a duplicate device using the measurements and lists of materials in your journal. Testing: Your team will test something that doesn’t work, modify its device and try again. Document all of this in your journal. The best journals contain notes taken during test trials: what you attempted, the number of attempts, results, lessons learned and next steps. Device evolution: Few teams come up with the perfect solution at the first meeting. Your device or parts of it will evolve over time as you test and modify. Document this evolution. The best journals contain detailed notes about changes based on testing and include reasons for the changes. This shows the judges how and why your device changed over time. Evidence of engineering analysis: Talking about trial and error is important, but you should also discuss engineering analyses such as mechanical advantages, force calculations, distance calculations, load, torque, stress, chemistry and materials properties. Costs: You don’t have to spend a lot of money to do The Tech Challenge. Both high- and low-tech devices can work well. Record costs in your journal. If you dig up free items from your school, garage or a junk pile, estimate how much they cost but mark them as “free.” Receipts are good but not required. The bottom line shows how much your device would cost to build from scratch. Safety: Safety is your No. 1 priority. Teams must handle and operate their devices safely. You’ll be asked during the interview to show how you followed safety rules at test trials as well as outside the museum. 3D printing: If you use 3D-printed parts, judges will want to see that you understand these devices and the code behind them. How were they created? Where did you find the designs? Did you make changes? The best journals list sources and record all modifications. Real-world applicability and the Spirit of the Challenge: The best journals document an understanding of real-world factors and contain a detailed explanation of how your design would work in the real world. What are some of the mistakes teams make with engineering journals? Disorganization: Some journals are a bunch of entries with no organization. These will score lower than a well-organized journal. No explanation of final design: Sometimes your first ideas don’t work out. Document everything, and indicate clearly which is your final design. Only some topics covered: If only some areas are well-documented, a journal will score lower than journals that cover everything. No journal submitted: This will lead to a score of 0 in this category. Your journal is a living document, which means your team should add to it throughout The Tech Challenge. Start your journal early, and record everything your team does. The team should decide together how detailed the journal should be. The best journals have enough information so someone could build your device using the measurements and list of materials you’ve provided. Almost any format is OK. Your journal doesn’t need to be a professional-looking, “finished” document or printed report. A handwritten journal in an inexpensive notebook is fine. It’s important just to write things down. Don’t wait until just before the showcase to start your journal. You’ll be scrambling to finish and you won’t remember everything you did. Display boards like those used for science fairs can be part of a team’s presentation, but are not a substitute for a journal. You can keep your journal on a computer, but you must turn in a printed copy. Write it all down. Start early. Keep it neat and organized. A picture is worth a thousand words. What should we build our device out of? There are many options when it comes to selecting materials for your Tech Challenge project. How easy is it to buy, borrow or find? Can you use any kind of glue or tape on it? Why use it instead of something else? Here are sample materials you may wish to use. This is just a starting point — the options are endless. Just be sure your materials are in compliance with the rules. How do we get ready for the showcase? Make sure you’ve completed your solution, talked about what everyone is supposed to do and prepared your journal in ways that demonstrate your spirit, ingenuity and teamwork! Practice talking about your device and your process. Be confident. Judges want to see what makes you a strong, creative team. Engineering design process: Judges will talk with your team about how it arrived at a solution. Your engineering journal and ability to discuss your process are just as important as your device. Be prepared to talk about how your solution would work in the real world. Engineering journal: Your team will turn in its journal. Don’t forget to make it clear which design is your final solution. Your team won’t be around to answer questions during this part of the judging. Device performance: Your team will demonstrate its solution on a test rig. Judges will evaluate how well your design meets the challenge. When brainstorming, it often helps to create a design sheet for each idea so that you can keep track of your ideas and add them to your journal. This is a sample template for a design sheet. Feel free to create your own.